On 25 August 2015, the Journal of Cultural Heritage published online the article The medieval roots of modern scientific thought. A Fibonacci abacus on the facade of the church of San Nicola in Pisa (alternative link). 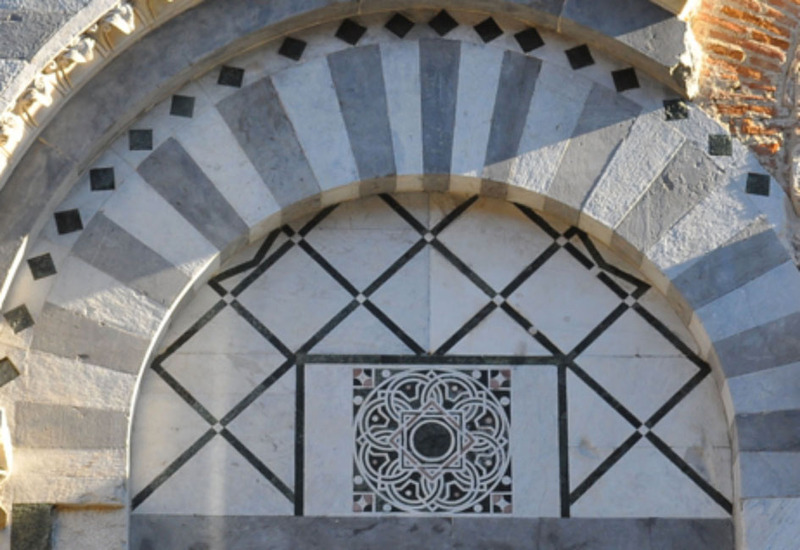 The author, Professor Pietro Armienti, discusses some geometric properties of a beautiful marble intarsia on the facade of the church of San Nicola in Pisa which was recently restored. Now, given an integer number m, the length of the side of a regular m-sided polygon inscribed in a circle of radius r is M2=2*r*sin(pi/m). In the paper the radius r is assumed to be 55 units. To show how the formula works, the author selects the values of R and n which minimize the difference between the exact value M2 and the approximation M1 given by the formula. For example in Table 1 (see the paper), we find that for m=5 the best choice is R=55 and n=2. One can verify the approximation by typing the values of R, n and m below and then pressing the button. IF WE HAVE THE FREEDOM TO CHOOSE THE TWO PARAMETERS R AND n, THEN WE ARE ABLE TO APPROXIMATE ANY NUMERIC VALUE IN A WIDE RANGE!!! Indeed, since tau^n decreases to zero as n becomes larger, it follows that the formula gives well-distributed values between R*0.66 and R*1.41. Therefore that formula is not so peculiar. You can for example replace tau with another positive number less than 1 and obtain similar results!! The table below gives the values of the formula by varying R (rows) and n (columns).